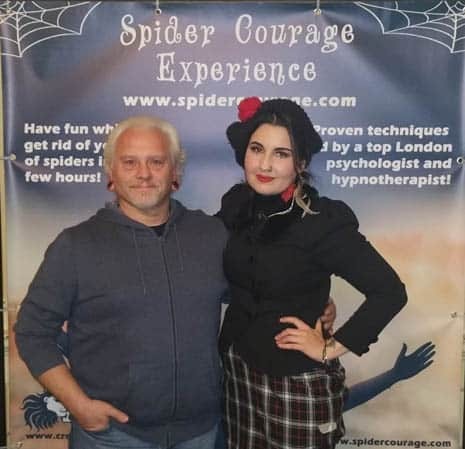 Our Spider Courage Experience workshop is one of the most complete and effective arachnophobia treatment in the country, you will not get better value in techniques, price and support. People can get over their fear of spiders in just a few hours whilst learning a variety of powerful psychology techniques to get over the phobia for good! You get to work with a top London Harley Street therapists who works with celebrities and free after care support if you don’t feel 100% over your fear, that is our guarantee! We have hundreds of testimonials to prove our incredible success, check out some of them on our Testimonials Page and our Spider Courage Facebook Page. Most of our Central London workshops are held at Oasis Academy South Bank at Lambeth North in Central London. We hold sessions on selected Saturdays from 12:45 to 6pm. Register on our mailing list on the sidebar to get more info, special discounts and exclusive material. We have transformed hundreds of arachnophobe’s lives with our powerful and proven methods that uniquely combines several different phobia fighting techniques that enables people to break free of their fear of spiders in just one session. 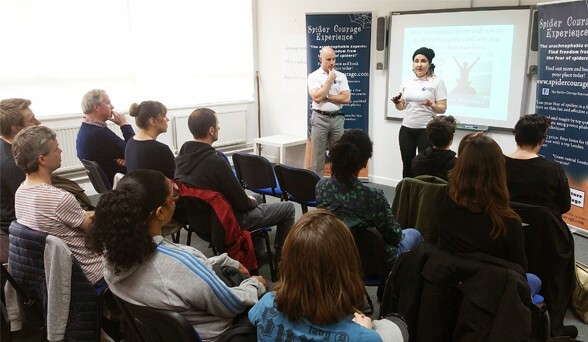 Using a combination of cognitive behavioral therapy, (CBT) Neuro Linguistic Programming (NLP) hypnotherapy, education, art therapy and an option of immersive therapy, not only will you get over your fear of spiders but learn how to build your overall confidence and courage. The Spider Courage Experience has been featured on Sky News, various ITV programmes, BBC Radio 2, Good Morning Britain with Piers Morgan, cured celebrities like James Jordan of their spider fears, has worked in collaboration with Chessington World of Adventures and is the only business endorsed by the British Tarantula Society! Below is our filmings with Good Morning Britain and James Jordan from Strictly come dancing who we cured of his fear of spiders. Be warned though there are spiders in this video! What are you waiting for, BOOK today! Creature Courage is really proud to be the first business to be endorsed by The British Tarantula Society, the world’s oldest ongoing tarantula society ! We have been endorsed for our dedicated passion for raising awareness and education about tarantulas and spiders with our highly successful and professional spider phobia therapy, the ‘Spider Courage Experience.’ Tarantulas play a big role in our therapy as often people find them a lot ‘cuter’ than the house spiders so they are a great stepping stone to building a bridge to spider appreciation. “I have attended a number of Spider Courage sessions run by Britain and her team. Honestly, I thought they were excellent. Very professionally run, full of accurate information about arachnids and extremely successful with tried and tested Neuro-linguistic programming and hypnotherapy techniques. The spider-handling aspect of the therapy is carried out under carefully controlled and closely monitored conditions with the well-being of the spiders being of primary consideration. I have witnessed first-hand individuals so phobic about spiders that the mere thought of them reduced these people to tears. I have seen the same individuals walk away from the course with that element of their lives changed beyond their wildest imagination. 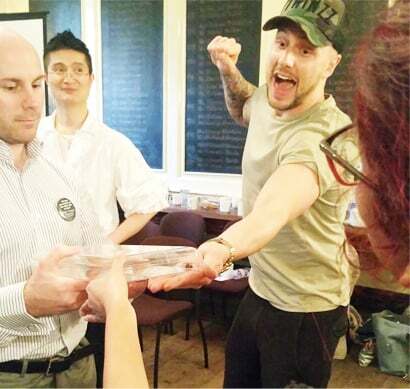 I have been so impressed with this course that not only have I given it my own personal endorsement, but put it to the BTS Committee who have also, for the first time ever, agreed to endorse this event too.” -Peter Kirk, Chairman of The British Tarantula Society. Peter Kirk is now an official team member of the Spider Courage Experience, just another benifit of choosing us!